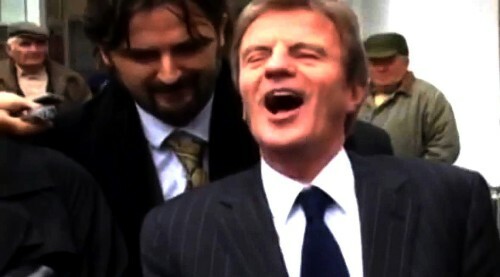 Kouchner laughs when questioned about reports of organ trafficking under his watch in Kosovo. Bernard Kouchner is a senior French politician and has for decades been a common face in the media, typically promoting this or that “humanitarian intervention” in some part of the world. He served as France’s foreign minister between 2007 and 2010. I was tremendously struck by a passage in Paul-Éric Blanrue’s book on Sarkozy and the Jews in which he mentions Kouchner’s hysterical reaction to one of his friends mentioning “the Jewish lobby.” Numerous senior figures, including President François Mitterrand and Prime Minister Raymond Barre, have noted that the lobby is a major player in French political and cultural life. Blanrue’s book more generally uses Sarkozy’s career to explore the secular trend in France of the steady replacement of vestigial Gaullist elites, still vaguely committed to French independence, by neoconservative and globalist elites. I incidentally mentioned, I no longer remember in what context, without any racist intent, the expression “Jewish lobby.” What had I said? Bernard jumped up at once and locked himself in his cabin. Christine [Ockrent, wife, DG of France Monde, TV5 Monde, France 24, RFI], went in as a scout, she came back bearing a Kouchnerian diktat: “I will leave this anti-Semitic boat first thing in the morning!” I didn’t sleep the entire night. At the crack of dawn, I broke into apologies without really knowing what had been my sin. This episode, I believe, will resonate strongly with many people who have had to interact with strongly-identified Jews whenever their perceived core interests are stake. Kouchner displays astounding emotional intensity and a sense that he is entitled to engage in unrestricted emotional blackmail against a friend for the smallest unintentional slight. But what is more terrifying, for a Jew, than the sight of goyim pointing out that Jews have a disproportional influence, or even form a “lobby,” in goyishe lands? Kouchner has built his entire career on the discrediting of the notion of national sovereignty and the principle of Western elites’ “right of intervention” (droit d’ingérence) anywhere on the globe, citing humanitarian or democratic pretexts. He has specialized and been very skillful in exploiting the mass media, using images of starving children or massacred civilians, to emotionally manipulate public opinion to accept imperialist wars. Kouchner’s first escapade abroad was as a physician in Biafra during the 1968 famine caused by the Nigerian Civil War. In 1971 he founded Médecins Sans Frontières (Doctors Without Borders) and became known in international media as the “French doctor.” He later rose in the ranks of the French Socialist Party, often serving in the government. As a senior French politician, Kouchner has exploited virtually every opportunity to agitate for war against European and Arab nationalists, citing his theory of droit d’ingérence. In 1991, as a member of the French government, he pushed for violating Iraq’s sovereignty to help Kurdish secessionists and called for the West to push beyond the liberation of Kuwait to topple President Saddam Hussein in Baghdad. Throughout the 1990s, he was part of the clique of overwhelmingly Jewish “intellectuals” in France (Bernard-Henri Lévy, André Glucksmann . . .) who never saw a war they didn’t like and enjoyed strangely systematic media access to promote these wars. There is a famous photo of him hauling rice into famine-wracked and war-torn Somalia. In 1999, following the NATO bombing of Serbia in violation of international law, Kouchner was appointed as the United Nations High Representative in Kosovo, effectively governor of the new ethnically-Albanian mafia state in that province. Kosovo was run by the former terrorists of the Kosovo Liberation Army and Kouchner had the dishonor of presiding over astounding corruption and criminality. Beside the oppression of the Serbs of Kosovo, Kouchner’s Albanians allegedly engaged in a gruesome trade of organ trafficking taken from combatants and civilians. Whereas senior United Nations and Council of Europe officials have backed the claims, Kouchner dismissed the matter on Serbian television with a hearty cackle and obscenities. In 2003, the “humanitarian” Kouchner backed President George W. Bush’s illegal invasion of Iraq, which led to the deaths of hundreds of thousands and the displacement of almost 5 million people. In 2007, freshly-elected French President Nicolas Sarkozy appointed Kouchner to be his foreign minister, despite the fact that the former is a nominal conservative and the latter was a card-carrying Socialist. This move made sense insofar as this distinction is spurious, and both men are dedicated to the same globalist program of neoliberalism, foreign wars, and indefinite displacement-level African/Islamic immigration. There is no left-right distinction in politics any more; the only valid distinction is between globalists and nationalists. In this respect Sarkozy and Kouchner were perfectly compatible as globalists. Foreign Minister Kouchner ended Jacques Chirac’s previous policy of timid independence relative to the United States, reintegrating France into NATO. He also moved to have France adopt the Lisbon Treaty reinforcing the European Union, despite the French public rejecting a very similar “Constitutional Treaty” in 2005 by referendum. Thus Kouchner was among the gravediggers of President Charles de Gaulle’s previous work of limited French independence, a balanced Middle Eastern policy, and at least verbal opposition to American imperialism. Since leaving office in 2010, Kouchner has also agitated for war in Libya, which has led to the destruction of the stable anti-Zionist regime there and its replacement with permanent tribal civil war. And of course he advocated war to depose President Bashar al-Assad in Syria, which has fueled the rise of the Islamic State. In each case, Kouchner has advocated policies which have led to the deaths of thousands of innocent people while at the same time advancing the interests of Israel by rendering the Arab states politically fragmented and militarily impotent. Kouchner has also asserted that whereas Iran must be deprived of nuclear weapons, the world has “a duty to protect [Israel].” Israel, let it be recalled, is an explicitly racist state with a Jews-only immigration policy. Indeed, Israel has been violating international law and ethnically cleansing the native Palestinians for half a century. Israel has also engaged in periodic wars of aggression. Yet Kouchner has curiously never applied his theory of droit d’ingérence to Israel and in fact in the past has taken the lead in cracking down on excessively pro-Palestinian elements in the French Socialist Party. Kouchner however is very critical of France, saying that “France is a racist country” and claiming that President Sarkozy “was detested also because he was the son of a Hungarian and the grandson of a Jew.” And while asserting that the entire world has a duty to support Israel with its Jews-only immigration policy, Kouchner has demanded that both France and Europe respond to the current migrant crisis by taking in more African/Islamic settlers. These migrants, incidentally, are coming to Europe in part precisely because of the murderous wars Kouchner has agitated for in the Arab World. For Kouchner, it’s a win-win situation. Bernard Kouchner’s entire life and career have been dedicated to promoting the interests and claims of universal jurisdiction of the American Empire and its European satellites. He has, objectively and consistently, agitated to destroy independent European and Arab nations, while simultaneously promoting the perceived interests of Jews and in particular the Jewish ethno-state of Israel. Hypocrisy is his right, I suppose. Why is he even a French citizen? ** The short answer to this question is obviously and at least in part the strength of “the-lobby-that-doesn’t-exist” meme in elite French circles. Kouchner’s president, Sarkozy, has made unbelievably Judeocentric statements over the years, presumably to pander to Jewish elites and fully cognizant that such statements will not hurt him with French voters, including most recently that “Israel’s right to security [. . .] is the struggle of my life” and that humanity has “contracted towards the Jewish people a debt which cannot be extinguished.” See Guillaume Durocher, “Paul-Éric Blanrue and the Jews: From Celebration to Censorship,” The Occidental Observer, September 24, 2015. Paul-Éric Blanrue, Sarkozy, Israël et les Juifs (Embourg, Belgium: Oser Dire, 2009).